A new portrait of President Barack Obama that depicts the POTUS as a Christ figure will be unveiled Wednesday. Cue the outrage. Perhaps sick of cranking out one cartoon noir portrait after another, New York artist Michael D'Antuono has latched onto the most obvious hot button imagery out there, Obama-as-Jesus. The painting shows the Commander in Chief sporting a smartly cut blue suit and a red tie topped off with a crown of thorns, his head bowed to the side and his arms outstretched, crucifix style, as he pulls back – or maybe drops – the curtain on the presidential seal. The title, of course, is a reference to John 14:6, "I am the way, the truth, and the life: no man cometh unto the Father, but by me." Michelle McGinty of BeliefNet took the bait, and she is none too happy. 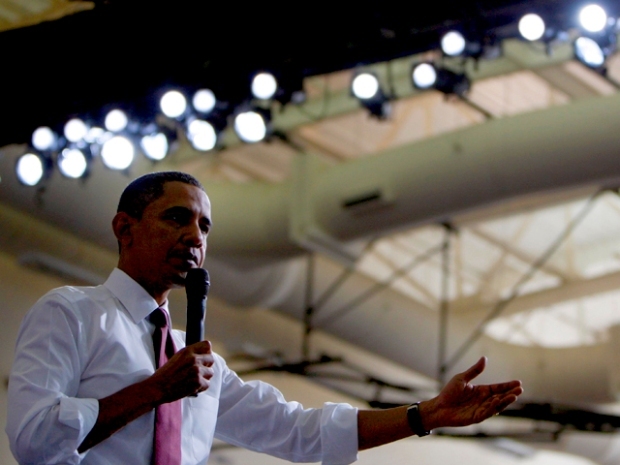 "How does Obama stack up against the One that the Bible calls the Messiah?" McGinty demands to know. "The comparison is laughable and it's my hope that one day the Obamanites who look at Obama as their messiah ... will learn that you can't put your hope and trust in a mere sinner like us." D'Antuono will be showing his latest work in Union Square to mark Obama's 100th day in office. "More than a presidential portrait," says D'Antuono's desperately promotional website, "'The Truth' is a politically, religiously and socially-charged statement on our nation's current political climate and deep partisan divide that is sure to create a dialog." In reality, this is actually nothing more than a desperate grab at some low-hanging fruit. 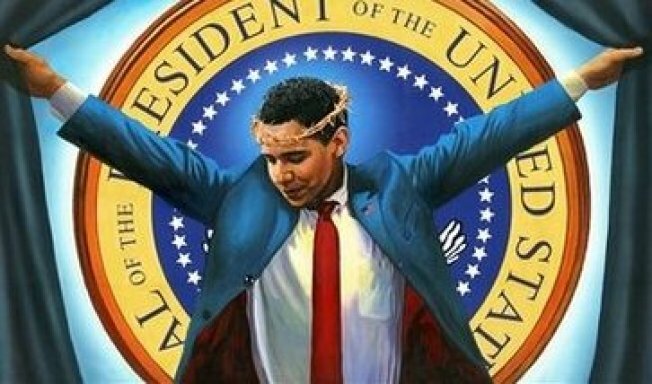 The Obama-Christ thing is so past done that one almost expects The New York Timesto do an expose on it. But the Obama-Christ-curtain combo does beg one question: Would Christ cover up Obama if he were giving a speech?